An upgrade from a trickle to a flood has made your reporter feel like he's living partly in the future: The Internet can still be really slow, even with a fiber link. I was one of the very first DSL customers of what was then called US West—later, its name became Qwest, then CenturyTel, and now CenturyLink. I upgraded in 1998 from dual-channel bonded ISDN, a whopping 128Kbps, to 1.5Mbps downstream and 768Kbps upstream ADSL. It was a huge improvement, and one I assumed was just the first step in achieving LAN-like speeds of 10s and then 100s of Mbps. Almost 20 years later, I was stalled on 18Mbps/3Mbps from Comcast Business. But with the press of a few buttons and the right neighborhood and timing, I’ve leapt 50fold down and 300fold up to fiber-backed gigabit Internet from CenturyLink. While I’m new to gigabit and fiber, after so many years of having extremely poor upstream speeds, I’m at the forefront of what will be millions—or even tens of millions—of U.S. broadband customers upgrading to 100Mbps and 1Gbps symmetrical speeds over cable modems, more advanced DSL flavors, and fiber. What can you expect when you’re lucky enough to be able to pick such fast service? In practice, it’s not always as speedy as advertised, but when “up to” is 1,000Mbps and you’re seeing “only” 200 to 800Mbps? You don’t feel the pain quite as much. And—an important and—the structure of the Internet makes it hard to figure out which link to blame. Often, it’s a software problem or a local network problem, rather than one of routing or throughput. I can’t knock gigabit broadband one bit, but the improvement is unevenly distributed. Google’s fiber-oriented speed test is required because other ISPs speed tests can top out above 100 or 200Mbps. For me, like most people already paying for allegedly high-speed broadband, $45 a month is neither a little nor a lot. We didn’t subscribe to cable or satellite television service, so our $135 is far cheaper than some typical “triple-play” bundles with voice, data, regular cable, and premium programming. We have a Netflix subscription and Amazon Prime, and are trying Hulu’s ad-free $12-a-month service, which we will likely cancel. (There’s not enough unique stuff at that price.) That adds up to about $30 a month, if you count all of Prime towards video streaming, even though we use it extensively for free shipping. I can make back the $45 a month by wasting less time, frankly. So much of what I do involves moving files around, syncing them up, and testing online services—especially cloud photo ones recently—that as a freelance writer, it was easy to make the switch when it became available in early October. Part of why I switched is because Comcast’s position on caps and overage fees is increasingly anti-consumer and pro-monopoly/duopoly bottom-line. Why didn’t I stick with the devil I know and upgrade to 100 or 150 Mbps service with Comcast Business or with its residential division? A few reasons. Comcast’s service has gotten flakier and flakier for me. I’d done a lot of work to isolate causes on my network, and it appeared to be entirely their issue—proven now that I have a different ISP, since the network infrastructure is the same and I’m not having the same problems. And because Comcast’s position on caps and overage fees is increasingly anti-consumer and pro-monopoly/duopoly bottom-line. In most markets, Comcast or another cable operator is the fastest provider and the only one with a triple play over the same wire. Some telcos partner with satellite or run fiber (like Verizon’s FiOS), but they’re at a disadvantage. Switching away from Comcast often means accepting low-speed service without much of a price advantage. Comcast has been testing a monthly throughput limit in some markets, where they allow around 300GB and then charge $10 per 50GB (or fraction) above that. A few days ago, they rolled out a new option in some places: $30 or $35 a month gets you unlimited usage on top of your existing fees. Comcast Business offers service in the same cities and regions with no caps, although they require unbreakable multi-year contracts for the privilege—cancel, and you owe either 75 percent (in one previous contract I signed) or 100 percent (according to a colleague’s recent contract) of the balance. I asked the local Comcast folks about residential service and caps. They couldn’t guarantee that I could switch to home service and get any exclusion. Comcast is starting to push out 1 to 2Gbps service, but the price is ludicrously high compared to existing gigabit fiber run by both municipal operations, Google Fiber, and telcos like CenturyLink. I’d been collecting reports from folks who had signed up and were talking about it on NextDoor, the hyper-local community message board site. People were generally pleased. And CenturyLink has no caps on its fiber offerings. When I discovered in early October that the fiber I’d seen being pulled to my block in June was finally lit up, I was elated. But after plugging everything in to my existing network infrastructure—three AirPort models of varying vintages connected via an ethernet backbone—I wasn’t able to get a speedtest to break about 70 or 80Mbps. I connected directly to the CenturyLink modem and, boom, several hundred Mbps! I was baffled, as my routers were all linked via gigabit ethernet switches. Once the stars and topology aligned, I routinely saw several hundred Mbps throughput. But weirdnesses remained. Once you have a super-fast connection, you notice when it’s poor. My 12-inch MacBook, which supports 802.11ac, would routinely report sub-100 Mbps downstreams when I tested. After various futzing, I found it preferentially connects not to either of the closer 802.11ac routers (one upstairs in our living and one just below it in the basement), but to the 100 Mbps ethernet-connected 802.11n AirPort Express several rooms away and in the basement! Toggling Wi-Fi off and back on forces a reconnection to an 802.11ac signal. With everything working, is the Internet a super wonderful dream? Well, no. But it’s better. With a surfeit of bandwidth, I gorged. I took a long-delayed move to shift from one hosted backup to another, and had 1.3TB of data to upload. It took 48 hours—but only because I hadn’t optimized settings in the first day. Nearly 300GB uploaded in the first day and then, after tweaking, 1TB in the next. Uploading vast amount of data, such as for priming a cloud-hosted backup or photo library, is a totally different experience on gigabit broadband. I tried messing with various cloud photo services, too. While I’ve uploaded a lot to Google Photos, I’d restricted myself to a subset. Now I added many dozens of gigabytes and tens of thousands more files. It went quickly, but nowhere near as fast as the upstream bandwidth would allow. I wanted to test out Amazon’s Cloud Drive option for photos, which is $12 a year for unlimited images and 5GB of other data, including videos, or free with a Prime membership. I pushed about 60GB there, but it took hours rather than minutes, due to throttling on Amazon’s end, not mine. It was easy to see how unevenly various websites and Internet services perform—and how CPU and software limited I was. I’ve used Firefox for years, from the point that Safari still had odd behaviors related to re-opening pages with forms, and wasn’t compliant enough to work with some sites. But after quite a bit of testing, I found Firefox was holding me back: Safari and Chrome are both lickety-split with the web, while Firefox’s rendering time seems to drag it down. Even with Safari, latency can be a killer when throughput is high. Latency is how long it takes for something to get underway, rather than how fast it occurs once it’s moving—like inertia versus momentum. Consider if turning on a water tap triggered a valve far away to open up and release liquid: even a huge, high-pressure pipe can’t make the water get to you faster if it’s “far” away. The same is true with some sites and services, where each interaction has a lot of handshaking back and forth, or in which the initial response is delayed. Dropbox, for instance, isn’t slow by any means, but it does a lot of collating and indexing when changes are made, and is always seemingly uploading file lists and checking things. Once uploads or downloads commence, they occur with lightning speed over gigabit broadband, however. Another clog, impossible to tell without a little sleuthing, is the interconnection between CenturyLink and the rest of the Internet isn’t possible always clear to use. CenturyLink can’t give me a dedicated 1Gbps channel, of course, and not every path between the telco and an Internet resource is going to be uncongested. The difference between local area networking (LAN) and wide area networking (WAN)—i.e., the Internet—were sometimes profound in a direction I didn’t expect. 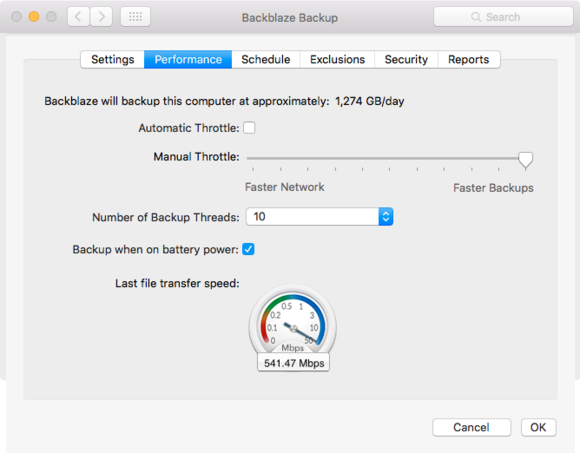 Copying something to another Mac on the LAN could take longer than uploading it to a distant server. Apple Filing Protocol (AFP) is hoary and inefficient, while Internet services have streamlined their file-transfer methods. So many things cease to be burdens. Downloading documents, files, or videos in the hundreds of megabytes to several gigabytes doesn’t require twiddling my thumbs and finding something to do in the meantime. They speed along and I can move on to the next activity right away. Uploading is the true dream, but I was so constrained—most people with broadband in America have more than 3Mbps upstream. Particularly for streaming video and Skype, I find that old frustrations are gone. While I’m capable of 4K video streaming in the future, I only have a 1080p HDTV, but I always get the highest-speed auto-negotiated rate. Skype is the most finicky of services at time, but with the new connection, I no longer have hiccups or troubles. The truth of gigabit broadband is not that it feels profoundly different or even faster. I haven’t changed many habits at all. Rather, it’s that I no longer have to consider Internet throughput as a factor in what I do. Instead of thinking about the net as something other, my local network has just been extended to be the whole world.